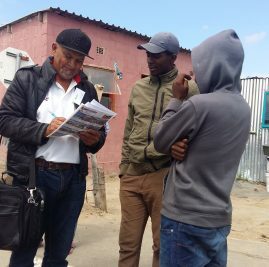 We’ve been taking to the streets more frequently lately, going around Fisantekraal, Klipheuwel and Morning Star communities to share what courses are starting at FCD. 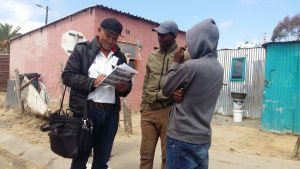 While we really enjoy connecting with the community out in the field, we are often overwhelmed by the harsh reality of the challenges people are facing. “Throughout the whole experience of recruitment,” says Leilani Gertse, “I was reminded of the verse in Romans 10, that if we don’t go and tell them about FCD they might never know and have this opportunity of reaching their own goals and unlocking their purpose and potential. And how are they to believe in Him of whom they have never heard? … As it is written, ‘How beautiful are the feet of those who preach the good news!’ ROMANS 10:14-15″. With the help of our team, consisting of Leilani, Morris, Siba, and Nombulelo we managed to speak to many people, hand out flyers, sign up interested students and finally register students for Job Readiness, English, Business Skills, Office Basics and Hospitality courses. We were particularly touched by feedback received from a mother of one of our recent recruits, Chrizelda Paulse, who shared that she had been concerned about her daughter’s lack of motivation and desire to find meaningful work. She had however, been pleasantly surprised recently to discover that her daughter had signed up (and participated in the job readiness programme run in Fisantekraal). She believes that it was the interaction that our recruitment team had with the grandparents of the child that led to her daughters change of heart. We plan to continue informing the communities in and around Durbanville of the empowering opportunities available to them through FCD. Putting a bigger team in place will help us to share the load of spreading the news.